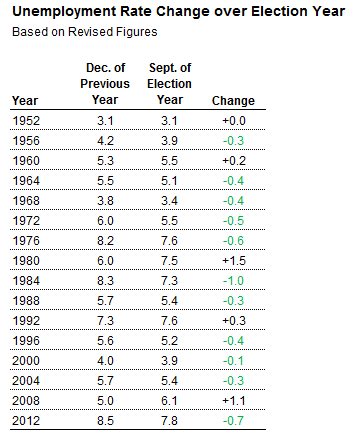 Note: The drop in unemployment alone is no guarantee of re-election — there was also a considerable drop in unemployment in 1976, and Gerald Ford lost. The new job numbers released on Friday morning provided balm for the frazzled nerves of President Obama’s supporters at the end of his worst week of the 2012 campaign. 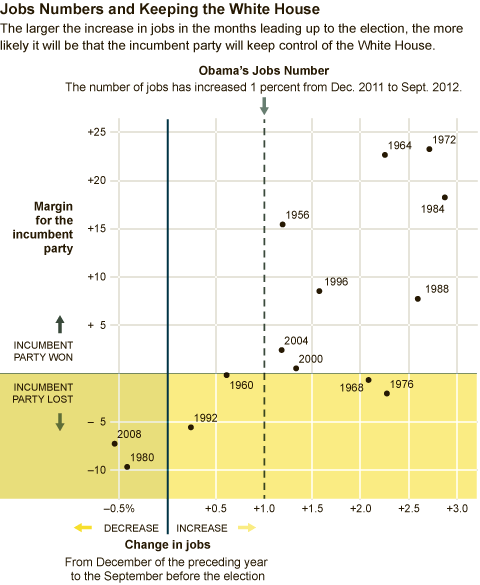 The national unemployment rate fell to 7.8 percent, the lowest rate of Obama’s presidency. The headline figure buttressed Obama’s argument that his economic policies were working, albeit more slowly than he would like. It could also help the president and his aides turn the page after his soporific and meandering performance at the first televised debate on Wednesday. Republican strategist Ford O’Connell said that the new jobs numbers were “a kick in the pants” for the Romney campaign, even though he stressed that conservatives were not in the business of welcoming bad news. He argued that the employment report had served to provide Obama respite, and came less than 36 hours after Romney had landed his most effective punches of the general election contest. The state unemployment picture worsened last month, with jobless rates creeping higher in 44 states, according to a government report released Friday. Only two states and the District of Columbia saw unemployment rates edge lower in July, while four states saw no change in rates, according to the Labor Department's monthly report on state unemployment. That's worse than the previous month, when far fewer states recorded increases in unemployment rates. In June, jobless rates rose in 27 states, while 11 states and the District of Columbia reported rate declines and 12 states had no change. Among key swing states this election, six states reported that their unemployment rates rose last month: Virginia, Florida, Colorado, Nevada, New Hampshire and Iowa. Ohio's unemployment rate was unchanged at 7.2%. Wisconsin, which CNN moved into the toss-up column Thursday, posted a rise in unemployment to 7.3% from 7%. Recent polls have shown Obama gaining an edge over his likely Republican challenger, Mitt Romney, in several so-called swing states — those that are considered up for grabs. What’s made the difference is that unemployment has dropped more sharply in several swing states than in the nation as a whole. A resurgence in manufacturing is helping the economy — and Obama’s chances — in the industrial Midwestern states of Ohio and Michigan. And Arizona, Nevada and Florida, where unemployment remains high, are getting some relief from an uptick in tourism. “The biggest reason for the president’s improving prospects probably is the economy,’’ says Peter Brown, assistant director of the Quinnipiac University Polling Institute. In particular, it's this sentence by the Financial Times' Ed Luce, who writes, "According to government statistics, if the same number of people were seeking work today as in 2007, the jobless rate would be 11 percent." Remember that the unemployment rate is not "how many people don't have jobs? ", but "how many people don't have jobs and are actively looking for them?" Let's say you've been looking fruitlessly for five months and realize you've exhausted every job listing in your area. Discouraged, you stop looking, at least for the moment. According to the government, you're no longer unemployed. Congratulations? Since 2007, the percent of the population that either has a job or is actively looking for one has fallen from 62.7 percent to 58.5 percent. That's millions of workers leaving the workforce, and it's not because they've become sick or old or infirm. It's because they can't find a job, and so they've stopped trying. That's where Luce's calculation comes from. If 62.7 percent of the country was still counted as in the workforce, unemployment would be 11 percent. In that sense, the real unemployment rate -- the apples-to-apples unemployment rate -- is probably 11 percent. And the real un- and underemployed rate -- the so-called "U6" -- is near 20 percent.